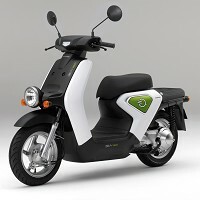 Leading Japanese car manufacturer Honda is going green with a new zero-emission electric scooter. The new EV-neo scooter that can be equaled with a 50cc petrol-powered bike can take one 20 miles on a single charge and can reach speeds of up to 20mph. The vehicle can be fully charged in four hours from a home socket and can charge about 80% in 20 minutes from a special machine. The product released in Japan is targeted at delivery companies such as pizza firms. Honda General Manager Toshiyuki Inuma said the new scooter gives the company a chance to make its presence felt in the electric vehicle area. Though Honda has the Insight hybrid car in its portfolio, but it has been quite inactive in the two-wheeler division compared with its competitors Nissan and Mitsubishi Motors. Mr Inuma said:" The motorcycle is a more nimble business, and it allows us to try out more things." The company plans to lease the scooters instead of selling them and hopes to set a price of up to £5,200 each - lower than that of a normal motorbike including petrol prices over three years. No details regarding overseas plans for the EV-neo or sales to individual customers have been announced.